Neo-Hunt 3 is a board/card game for 2-4 players. Each player controls a team of 3 varans with aim to kill as many as troopers and varans as possible before all troopers are killed or one varan team destroyed entirely. The gaming time is 30-60 minutes. 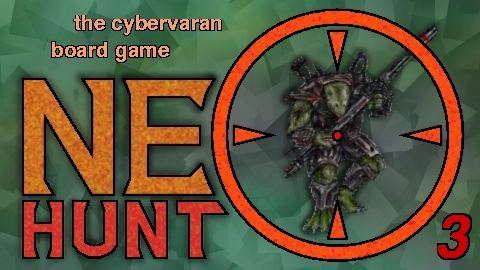 Neo-Hunt 3 is fourth in a line of Neo-Troops, the cybervaran rpg based board/card games. Cybervarans are cyber- and nanoenhanced vat-grown killing machines, and are equipped with big weapons, heavy armor and cloaking device. There is two version available from the game. The new year 2003 version (3.3) and the old version. Playing cards and counters. Cards are provided as ready postscript files, see appropriate preview pages (quick link to 3.3). See generic guidelines of how to use them. Color printer is recommended. Some table to put gaming board on. I prefer to have a glass plate on top of it so it is easier to move pieces around. Other choice is to make gameboard tiles heavy enough so that they do not move around. Some counters for troopers (50 needed) and for varan damage. I use colored glass gems. Each player has 3 varans, with various powers. A is an assault varan. Fast and deadly in close quarter, perhaps your most efficient weapon. However, its stamina isn't that great so beware of firepower varan in range and grenades. B is a support varan, combining firepower with moderate mobility. No real weaknesses and like assault varan has handy grenades. C is a firepower varan, ultimate in ranged combat. In addition to higher firepower than support varan has, it also has special weapons against varans and highest endurance. However, it is very slow and bad at close quarter firefight and melee, so beware of being swamped by trooper hordes. Troopers are the main target of the varans. Each trooper counter in the game represent a small group of human soldiers armed with various lighter weapons like assault rifles, grenade launchers and plasma guns. They are easily killed with big guns, but when many groups are together, they become a threat even to varans.